Top floor apartment with amazing views of the city 180 degree views from the private Balcony ... it is a wonderful location right on the center of the Town, a few blocks from everything, key location for downtown business, shops and restaurants around. Fully equipped kitchenette and laundry needs inside washer and dryer, and conform for your stay. 1 Bedroom with a comfortable Queen bed and sofa bed inside the bedroom. Full living room with a sofa bed to enjoy the panoramic views of the city. Private corner deck/ balcony is great for sun bathing and dining al fresco. The building has a elevator and security guard on the main entry of the building. 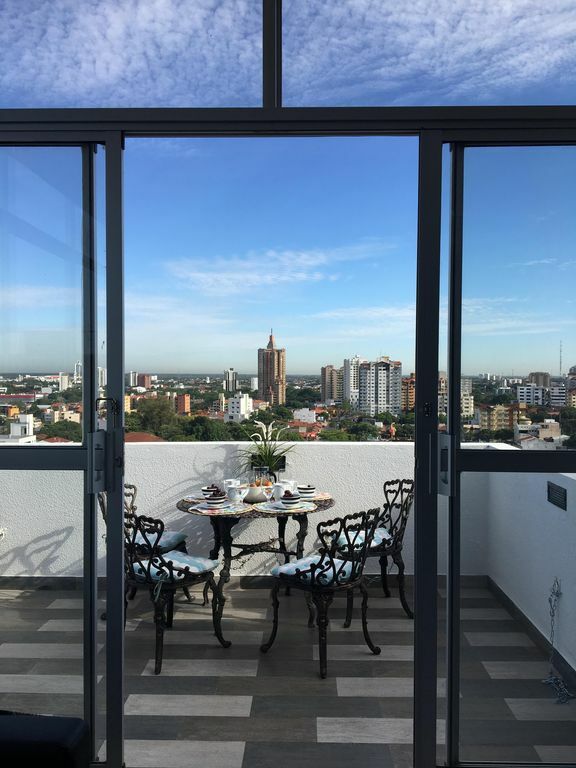 The apartment is in the center of the City which meant you are a short walk from the local market and amenities. Spectacular apartment with amazing view. The terrace is huge with amazing sunsets. Nice furniture, great kitchen layout. -Good WiFi - TV cable -modern AC - and modern bathroom! Top Flat apartment with great view of downtown. Five minutes walk to park Arenal, Plaza 24 of September, the Church of Santa Cruz, arts museum and lots of shops and restaurant. Great spot to explore! There is dining stool on the island kitchen and also a round table for 4 outside in the balcony. Lovely clean apartment with gorgeous view over city and sunsets. Highly recommend to stay with very kind host! I am very happy with everything! Cristina was just very accommodating and great host! Thank you very much for everything! We really enjoyed our stay and hope to comeback in the near future..
Cristina’s apartment feels as close to heaven as I can get in an apartment. Nine stories up and a corner unit with lots of glass, the panoramic view and sunsets are incredible. The terrace is simply fabulous. The décor is fun and modern, and Cristina has obviously given much attention to what guests need. I love to cook and the kitchen was well equipped. The building is older but very nice, and from the guards to the neighbors, I felt safe and welcome. The location is in “el Centro,” only a few blocks from the main square and with a supermarket, shops, and restaurants nearby. Loved my visit … many thanks, Cristina. It was a pleasure having you as guest and I will be delited to host you anytime. Thank you Daniel ... great guest.... I will host you anytime! I really enjoyed the locator the property just blocks away from the market and numerous hospitals. The apartment was beautifully decorated and equipped with everything you need to enjoy your stay. Thank you Alfredo for staying with us, it was a pleasure having you a guest, since you took care of the apartment as it was yours... hope to welcome you anytime you would like.